Want the most from your search? Sign up for free You'll get access to high quality photos of every listing, bookmarking capabilities, and personalized searches that you can save and return to whenever you like. 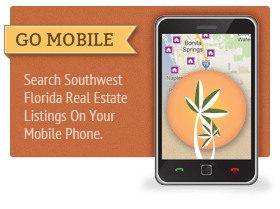 You can even request that listings matching your SW Florida homes for sale search criteria are automatically sent to you, right when they're listed! 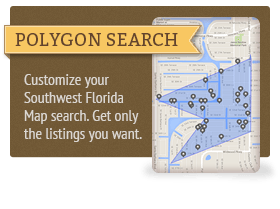 We make it easy to find your next home in Cinnamon Cove. There are several models of single family homes and duplexes throughout the community. Many are situated on the three lakes in Cinnamon Cove. There are two and three bedroom homes. Some have living rooms as well as Florida rooms. There are eat-in kitchens and more formal dining areas in some. All have lanais and garages plus many other lovely amenities. Some homes even have fireplaces. Terrace Condominiums offer a simpler lifestyle with minimal maintenance. Each of these buildings is three stories high and contains 30 living units. They have one and two bedroom units. All have lanais and overlook one of the three lakes found in Cinnamon Cove. Each condominium building has an elevator and covered parking with secure storage space. Two types of Villas can be found in Cinnamon Cove. There are the garden villas and the pool villas. The pool villas surround a private swimming pool that is gated for those residents only. The garden villas offer a common garden area with a tiki hut and patio to enjoy the outdoors. These units are single story. They offer two bedrooms and two bathrooms. Covered parking and secure storage units are included. The amenities, and activities, at Cinnamon Cove are managed by an on-site resident manager coordinating dinner dances, concerts, fashion shows, and lifelong learning experiences. The main clubhouse features fitness, tennis, bocce, pickleball, shuffleboard, a screened pavilion overlooking the lake where residents meet for BBQs, or you can entertain your family. You can also play billiards, ping-pong, read in the library, or scan your email with the WiFi available. There are clubs for bridge, water aerobics, chess, computers, and many seminars provided by tax and investment counselors and health professionals. 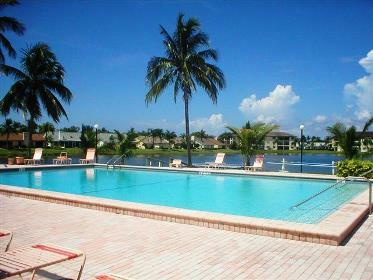 There are satellite pools throughout the community and fishing in all of their three lakes. 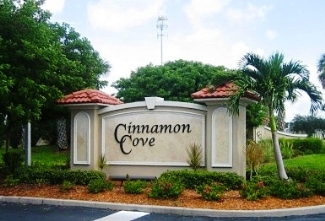 Cinnamon Cove is located just west of I-75 and north of the intersection at San Carlos Boulevard and Summerland Road in Fort Myers, Florida. The Fort Myers Beach Trolley located right outside of Cinnamon Coves provides an accessible beach life for all residents. With two bus stops located outside of both gates at Cinnamon Cove, residents have public transportation to reach the Fort Myers Airport located less than 15 miles away. Major grocery chains, pharmacies, and restaurants are just a short walk away as well. Cinnamon Cove offers you an active, friendly, and casual living environment that is conveniently located near Southwest Florida’s International Airport and great shopping. This is a bargain for a 55 Plus community! Questions About Cinnamon Cove Real Estate? If you have additional questions or would like to get started on your search for Cinnamon Cove real estate, please don't hesitate to contact us.